Yountville is the perfect base for exploring Napa Valley Wine Country. 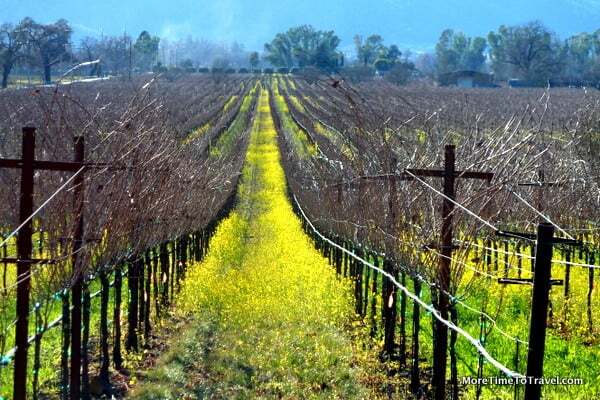 Like any first-time visitor to Napa Valley, California, I couldn’t take my eyes off the miles of manicured grape vines lining the fields on both sides of Route 29, the main stretch of road that runs about 30 miles from Calistoga (in the north) to American Canyon (in the south). With a rich history of farming, ranching, winemaking, and hospitality, the town of Yountville—which sits almost equidistant from each end—is often called heart of the Napa Valley. George Calvert Yount was the first non-native to settle in the Napa Valley, after receiving a land grant of almost 12,000 acres in 1831 from the Mexican Military governor of California. The trapper and lumberjack soon planted pear trees, roses, strawberries, and mission grapes on his land—the grapes originally brought to northern California by Franciscan monks, who used them for sacraments. When Yount died in 1866, this growing settlement, previously called Sebastopol, was renamed in his honor. Since then, Yountville has earned a reputation for being a center of hospitality that George Yount never could have imagined. The little town he began has mushroomed to a population of some 3000 full-time residents (1500 of whom live within the confines of the Veteran’s Home that opened there in 1884). Yountville still feels intimate, especially when you sit down for a cup of coffee at the Yountville Deli or wait on line for a cup of coffee at the Yountville Coffee Caboose. Most townies live in unpretentious looking but expensive mission-style bungalows with large, inviting porches. During the harvest season, the town is a magnet for gastronomes from the Bay area and beyond with two Michelin-starred restaurants: Thomas Keller’s French Laundry (with three stars) and Bouchon Bistro (with one star). Also within walking distance are two Michelin Bib Gourmand restaurants, Bistro Jeanty and Redd Wood (selected for their moderate pricing; diners can order two courses and a glass of wine or dessert for $40 or less). Another favorite is celebrity-chef Michael Chiarello’s Italian restaurant, Bottega. Yountville is also home to the Napa Valley Museum, the Lincoln Theatre, and numerous wine tasting rooms and parks. Its impressive public arts program has more than 30 pieces of sculpture on display outdoors. The town is a great place to stop for a memorable meal or to stay overnight at its one-of-a-kind hotels and resorts, including but not limited to the Bardessono Hotel and Spa, a luxurious but energy efficient LEED Platinum certified property; North Block Hotel, a contemporary boutique property; and the Napa Valley Railway Inn, a series of quirky railroad car suites that still sit on their original track. Moreover, Yountville’s location offers tourists a perfect base for visiting other cities and towns at both ends of the Valley. Yountville sounds like a delightful little winery town – like Healdsburg in Sonoma maybe? We’ve been to that area twice in the last two years. We stay with a friend in Napa. Charming area, with great food and wine–obviously. We’re looking forward to our return trip this year. You’re lucky to have friends in the area to visit! We have only passed through the Napa area, obviously we need to spend some more time. Definitely a place to stop and return to more than once. You’ll love it! Our palates are obviously aligned, Suzanne. Both are great restaurants! Isn’t it always such a pleasant–and unexpected–surprise? Thanks for sharing the link, Carole! The French Laundry is on my dream dining list. Maybe we’ll get there some day. Still on my dream list, too! Reservations are hard to come by. Need to be made months in advance. The French Laundry is on the top of our list! I love travelling round wine regions but I’ve not been to this area. Looks lovely though and so does the food! If you love wine regions, you’ll love this one! With so much wine country here in Washington we’ve gotten lazy about heading south. You’ve reminded me of our trip to Healdsburg – now too many years ago. . .might be time to make a return and visit Yountville. And Healdsburg is on my list! I cycled through Yountville a few years ago and loved the area. But to see it as shown with your first photo would be even better. I’m impressed with all the public art as well as the art at wineries. Now if only it was closer so I could visit more often. I have always wanted to visit Napa Valley but don’t like crowds. Yountsville looks like a beautiful place and a great place for me to use as a base. Because of its central location, it’s my favorite base in Napa! Reading this makes me want to return to Yountville – I was there many years ago, and have such fond memories of it. I’m ready to return, too! I realize that it is expensive, but I can’t wait to sample some of these fine restaurants, as I hear they are some of the best in the world.